Afraid of having sleeping troubles this summer? These tips could help. We’re rolling around to summer and that means most of us are spending more time outdoors, enjoying the perfect weather. That said, there are some issues that can come with summer, even those that may impact how you’re sleeping at night. All of these issues are, thankfully, very easy to deal with—it’s just a matter of arming yourself with the right knowledge. Here are four common summer sleeping issues that you may be experiencing. Since the weather has warmed up, many people are out and about, taking advantage of the nice weather. 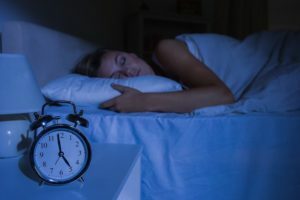 Whether you have neighbors who love to party during the night at prime sleeping hours or you just want to get to sleep in without being woken up by the neighborhood kids, noise can be a huge hindrance to sleep. If it’s something your neighbors need to fix, try having a talk with them—otherwise, invest in some ear plugs or a white noise machine to help you get that much needed sleep. That enjoyable hot summer weather also means your home is going to get hotter. The obvious solution is to try to adjust the thermostat a bit, but even still, you may be kept up at night from that warm weather. Some mattresses are better for controlling sleeping temperatures than others, so that’s worth looking into. It’s also a great idea to look into mattress toppers for a more affordable option. If you’re an early sleeper, the sun can make things difficult for you. Some people have different sleep schedules depending on their jobs and summer can make that tricky. Take a look into blackout curtains that will keep your room nice and dark during those bright summer days. Another method is using a sleep mask, a comfortable option that will give you the proper atmosphere. Late spring and early summer are when pollen counts really hit their all time highs. You can’t just get rid of allergens, so if you’re a true allergy sufferer, it’s worth talking to a doctor and seeing what they can do. If you have an old mattress, it may be time to swap that out as well. This entry was posted on Friday, June 8th, 2018 at 3:22 pm. Both comments and pings are currently closed.